【Material】:This cellphone ring grip stand holder construction from soft silicone eslatic and the hand hold ring with zinc alloy bearing to keep rotating sturdy, the adhesive of the holder kickstand rings is surprisingly strong.It will prevent the phone to drop on your face when you on bed, and hands free to watch youtube. 【Great Design】: Unique appearance design formation of scrub sense avoid the scratches when the ring stand on table, the firm round ring is built with a soft form cushion effects to decrease finger injury. 【Instruction】: The ring swivels 360 degrees so you can view the screen portrait or landscape, also it can 180 rotation foldable and the ring grip holder include metal help to as a car mount when you driving. 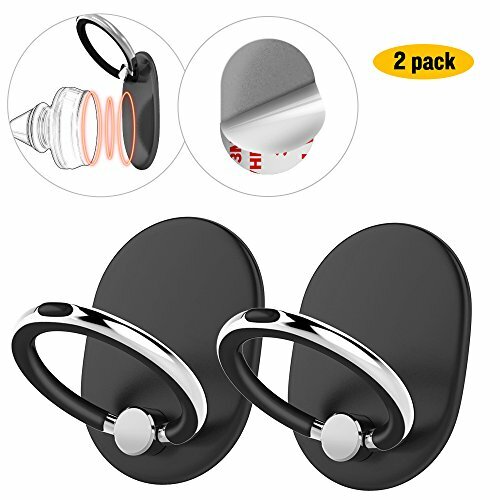 【Multi function】: It sticks to you phone cover and you can do anything with cellphone, much easier just use one hand will operate freely, great for giving you an added sense of security while holding. Also can be used as tablet ring stand holder, it has magnetic plate inside for car mount usage. 【Feature】: The phone ring stand is an efficient way of preventing your phone from slipping off your hands, the ring holder as a temporary stand when you place your phone or any other electric equipment on a table or any flat surface. Great Product for keeping your devices from falling or slipping out of place!!! Pretty sticky and pretty nifty. more than happy to have it!!! Keep my items safe, from sliding out of my hand.